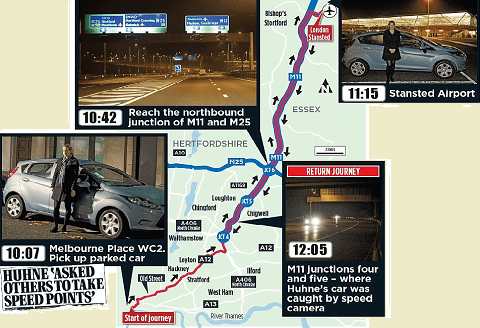 The Mail on Sunday has gone to the trouble of recreating the journey that Vicky Pryce would have had to have undertaken to have got the speeding ticket that she alleged Chris Huhne actually deserved. It was back in May that this blog revealed that Vicky Pryce was speaking at an event at the LSE on the night in question. Tracing the route she would have had to have driven it seems it is nigh on impossible for her to have done the journey in the time required. The police have been investigating this case for six months, the CPS has been avoiding taking the case to Court for three months. It is a fundamental tenet of our justice system that all are equal before the law. The CPS appear to be nervous about prosecuting this case because Huhne is a Cabinet Minister. Justice delayed is justice denied and it is time the evidence was tested in Court.